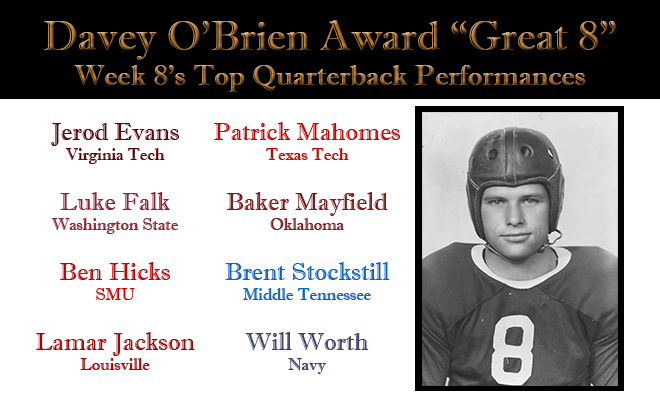 FORT WORTH, Texas (Oct. 24, 2016) – Three players appearing on the Davey O’Brien “Great 8” list for the first time in their careers highlight the eight performers named to the exclusive club in week eight of the college football season. 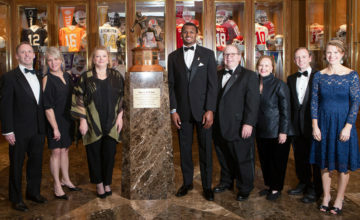 The eight honorees, as determined by voting from the award’s selection subcommittee, include: Jerod Evans of Virginia Tech, Washington State’s Luke Falk, Ben Hicks of SMU, Louisville’s Lamar Jackson, Patrick Mahomes II of Texas Tech, Oklahoma’s Baker Mayfield, Brent Stockstill of Middle Tennessee and Navy’s Will Worth. 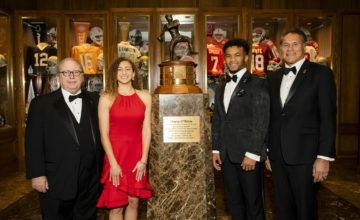 Evans, Hicks and Stockstill are all first-time honorees. Meanwhile, Jackson appears on the list for the sixth time in 2016. Mahomes and Mayfield are each being recognized for the third time this season, while Falk and Worth are on for the second time. Was 21 of 33 for 259 yards and two touchdowns and rushed 13 times for 98 yards and a score in a 37-16 triumph over Miami. Threw for 398 yards and three touchdowns with no interceptions, completing 42 of 53 passing attempts, in a 37-32 win over Arizona State. Led SMU to a victory over its highest ranked opponent since 1983 by going 16-for-31 for 228 yards and three scores and rushing for a touchdown in a 38-16 win over No. 11 Houston. Collected four touchdowns (three passing, one rushing) and contributed 431 total yards (355 passing, 76 rushing) in a 54-13 victory over NC State. 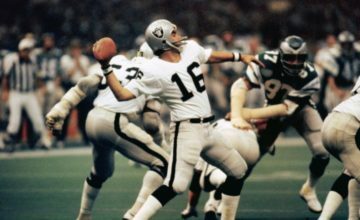 Set an NCAA record with 819 yards of total offense, matched the all-time record for passing yards (734) and had seven touchdowns (five passing) in a 66-59 loss to Oklahoma. Broke the school record with seven passing touchdowns and was 27 of 36 for 545 yards in a 66-59 victory over Texas Tech. Brent Stockstill, Middle Tennessee, So., 6-0, 206, Murfreesboro, Tenn. Led Middle Tennessee to a 51-45 victory over Missouri by connecting on 23 of 41 passes for 280 yards and four touchdowns and rushing seven times for 70 yards. Ran for a career-high 201 yards and three touchdowns and was 3 of 4 passing for 85 yards and a pair of touchdowns as Navy upended Memphis 42-28.